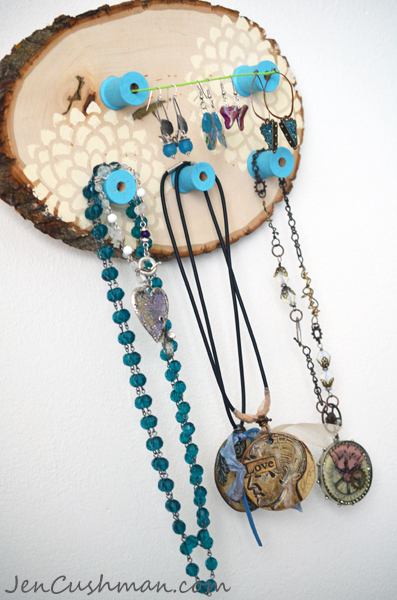 As a jewelry maker and mixed-media artist, I’m always looking for fresh and fun ways to display my wearable art. Did you know that so many of the fantastic wood products made by Walnut Hollow provide the perfect base for beautiful and useful forms to hold and store your jewelry? For my project today as part of National Craft Month, I wanted to create a fun and functional wall display. 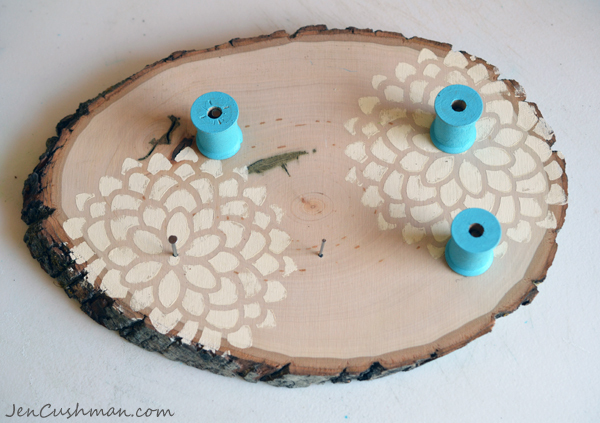 It’s easy to upcycle old wooden thread spools into knobs when you use a Basswood Country Round as the substrate. 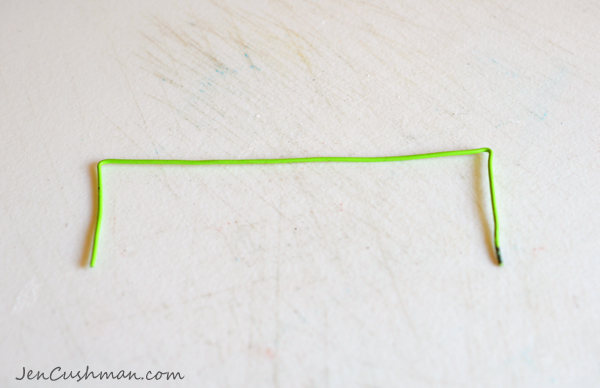 The best part about this project is that you probably already have the supplies in your craft room to make this today. 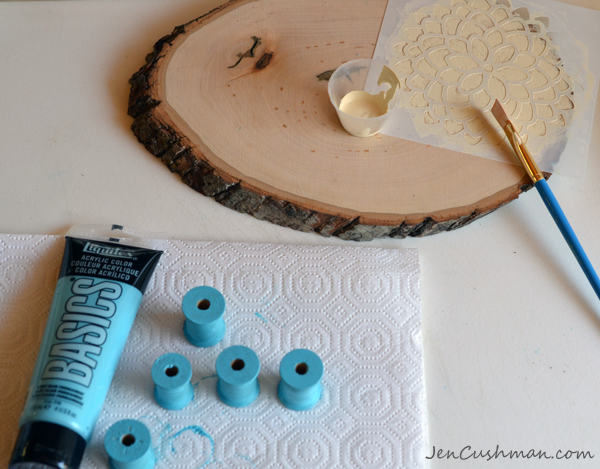 Add a hanger to the back of the basswood round so you can later hang your project on a wall. 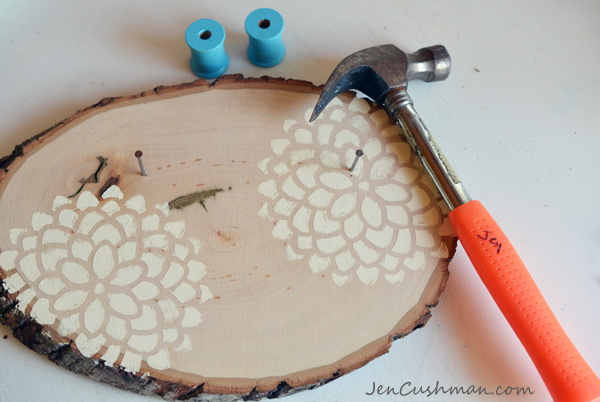 Next, place stencil onto the wood and start to paint. If you are using a paintbrush rather than a sponge when stenciling, be sure to have a paper towel handy to wipe off some paint before adding to to the wood. This will help you control the paint so it’s not too “gloppy” and doesn’t seep under the stencil. 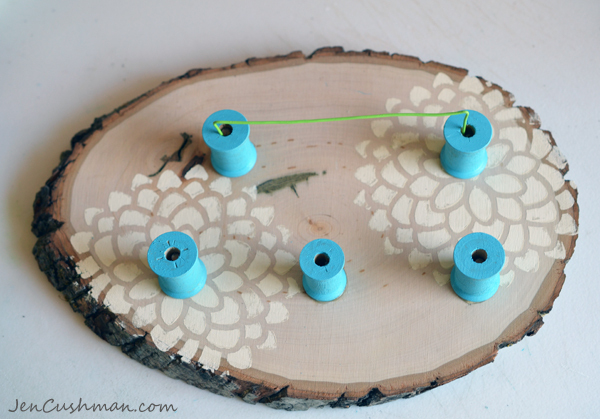 After you’ve painted the stencil pattern, go ahead and paint all the wooden spools the color of your choosing. I used a blue/greeen/cream color palette for this project. 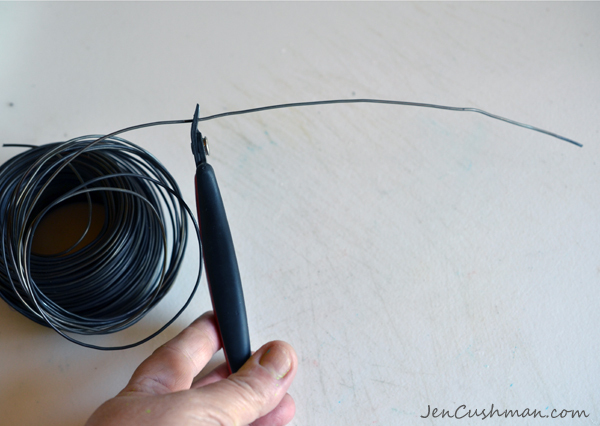 Use wire snips to cut a 8 inch piece of steel wire from the roll. 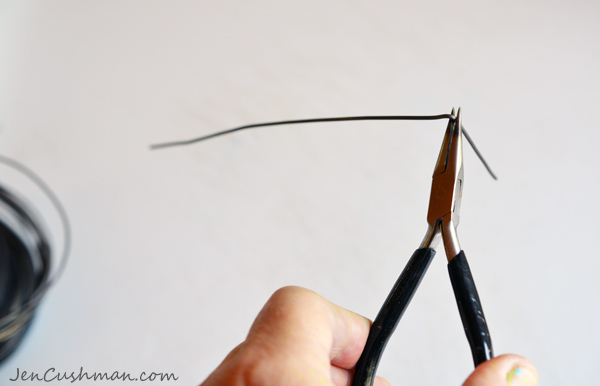 Use your flat nose or chain nose pliers to make a 90 degree bend in both sides of the wire. 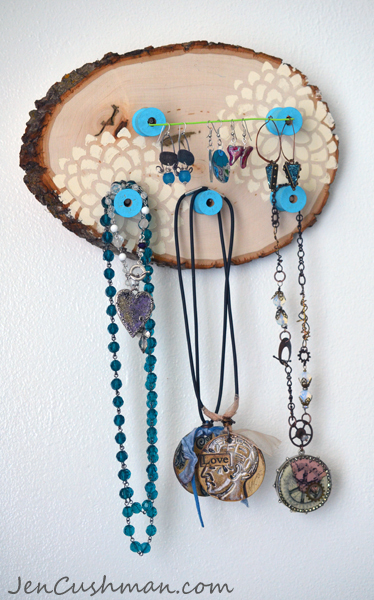 Decide where you want to place the spools for your jewelry display. Hammer nails into the wood. You will need the nails for this project to add strength and structure to the holder. If you glued the spools without adding the nails, the weight of the jewelry could easily cause the spools to break right off. Hammer three more nails in the spots where you wish to place your necklace holders. 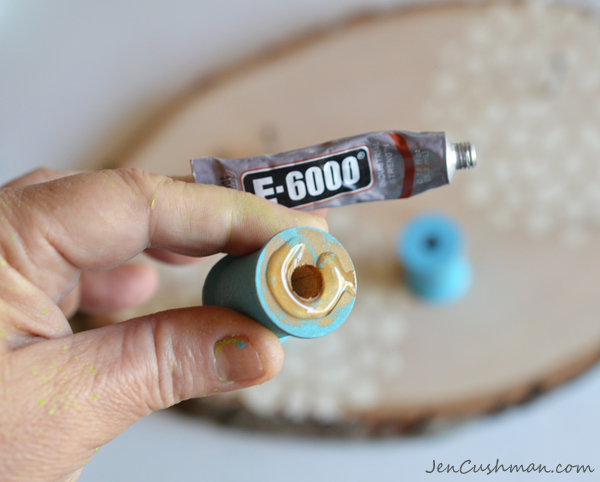 Use a strong glue such as E6000 on the bottom of the wooden spools, place over the nails and glue to the wooden base. 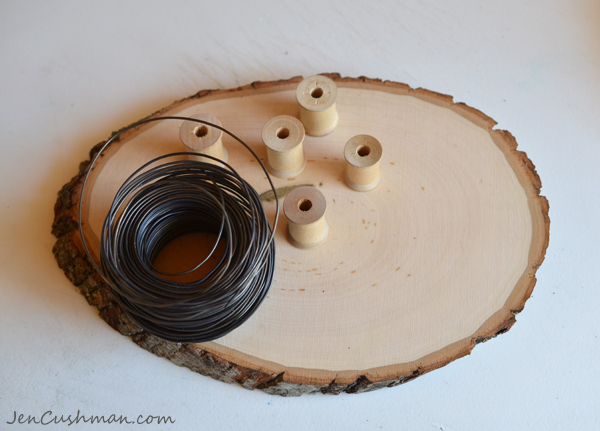 Add glue to the ends of the wire and place them into the spools, creating the earring holder. 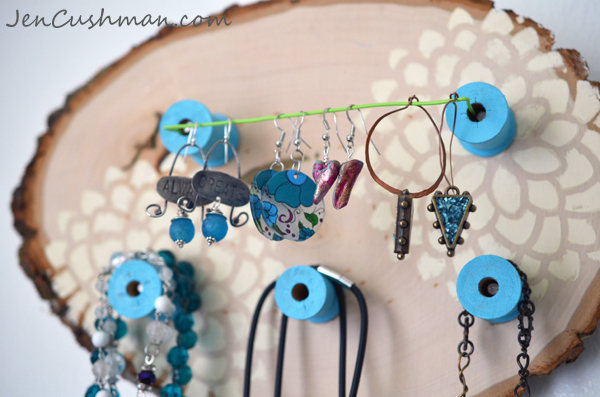 Hang your favorite jewelry for a cute display. What colors or designs will you choose for your display? Did you know I recently filmed a DVD using another fabulous Walnut Hollow product? Check out my blog today to see how I used the large French Provincial Signboard for my vintage-Parisian chalkboard. 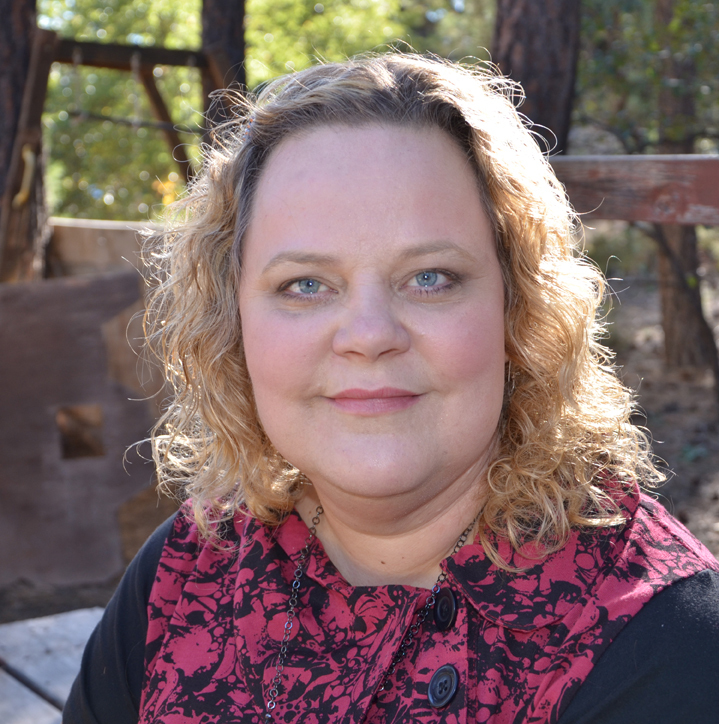 Bio: Jen Cushman is a mixed-media artist, instructor, columnist and author of two books; “Making Metal Jewelry; How to Stamp, Form, Forge and Fold Metal Jewelry Designs” and “Explore, Create, Resinate; Mixed-Media Techniques Using ICE Resin”. Her art has been published in numerous national magazines. She writes a column called The Mixed Media Metalsmith for Cloth, Paper, Scissors magazine and also a business advice column for Artists and Makers magazine. Since today is July 4th and we are celebrating Independence Day, I thought it would be appropriate to share something important to Walnut Hollow. If you never know anything else about Walnut Hollow but one thing, I hope you know that all of our wood products are Made in America. And that is something the Ladd Family and all the Walnut Hollow employees are very proud of. 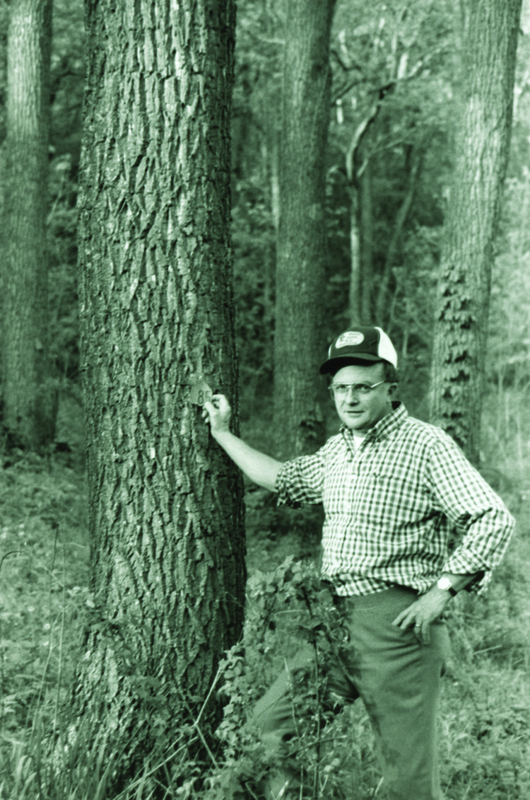 Walnut Hollow was founded 42 years ago by Dave Ladd. When Dave saw his wife Nancy decoupage crosscut pieces of wood, it sparked an idea that became a well-respected, international corporation. We manufacturer various styles of wood products sold throughout the United States, Canada and foreign countries. All Walnut Hollow wood products are made in the heartland of America. 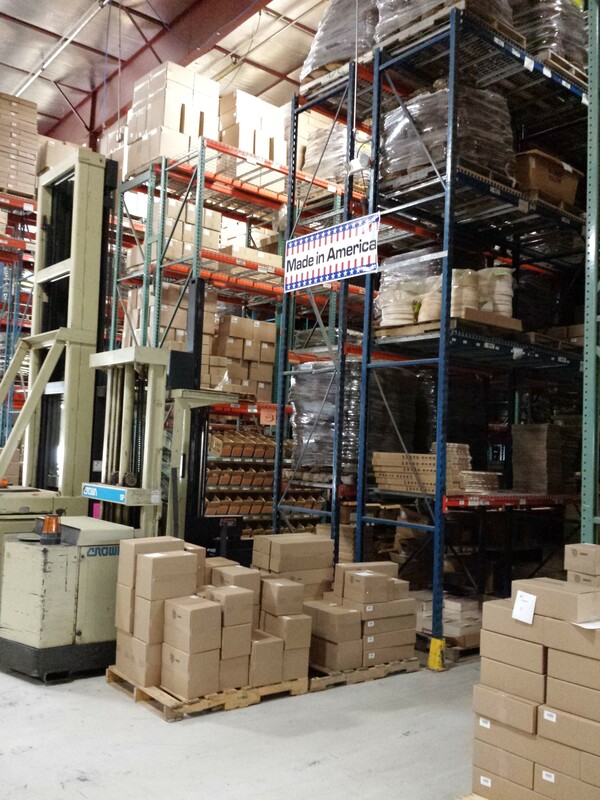 Our factory in Dodgeville, Wisconsin employs local folks and most of them have been part of our company for many years. Our hard-working employees take exceptional pride in their work to bring the best and innovative products to market for our valued customers. 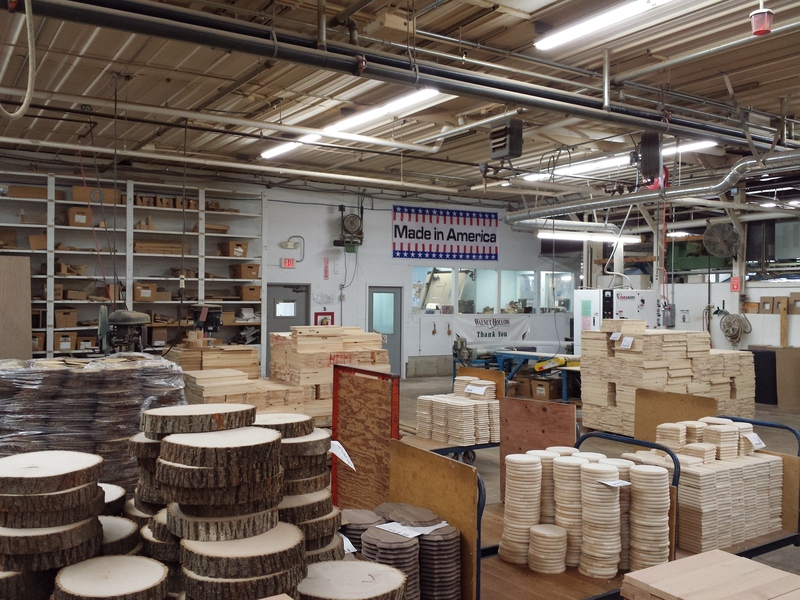 These are photos of our factory where the wood products are manufactured. We also take pride in safety. 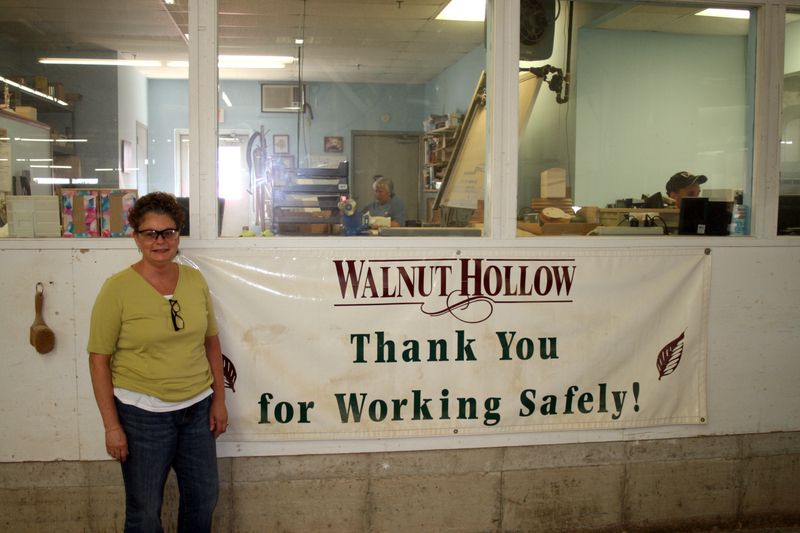 This is a photo of our President, Sandra Ladd-Bartelt, Dave’s daughter, thanking all Walnut Hollow employees. The 2013 Outstanding Manufacturing Safety Performance Award was presented to Walnut Hollow by Acuity Insurance. It is a great honor to be recognized for working safely. We take great pride in producing products that are not only environmentally friendly but are also highly adaptable to many different markets. Our commitment to quality products and our environmental initiative are beyond compare. We help to keep America strong and employed. 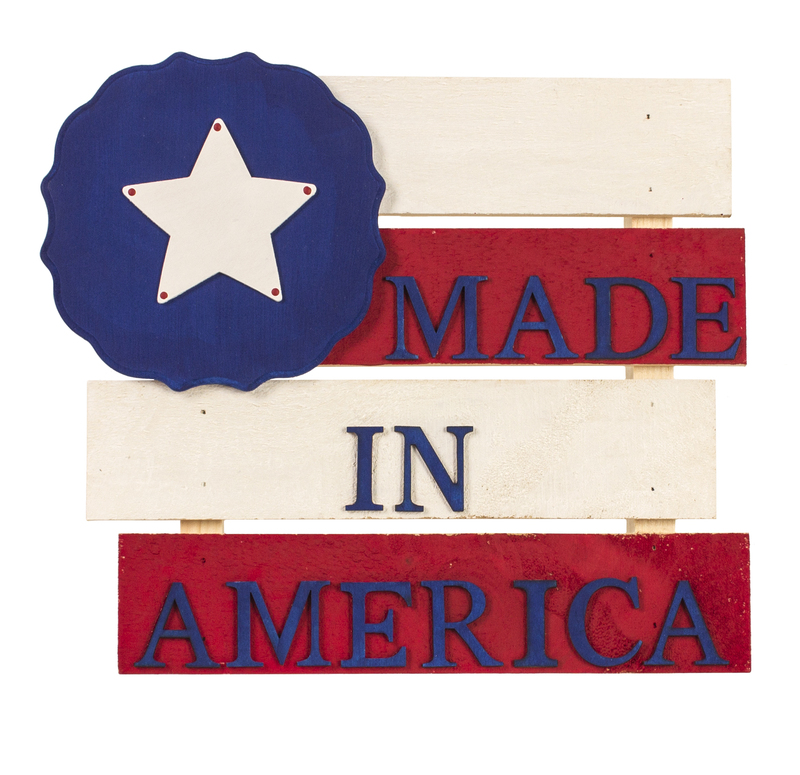 Always remember, Walnut Hollow wood products are Made in America.